For anyone with an interest in the history of witchcraft, the publication of a new book by Owen Davies is something to get excited about. He not only really knows his stuff, he also writes about it in an entertaining style. 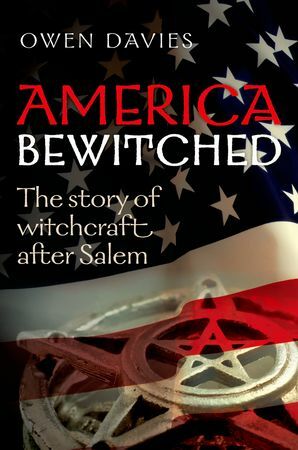 America Bewitched: The Story of Witchcraft After Salem is the latest subject to be explored by the University of Hertfordshire Professor of Social History, who is also the author of Grimoires - A History of Magic Books, Paganism - A Very Short Introduction and Magic - A Very Short Introduction. A fascinating read it is too. Publisher OUP says on its website: "The infamous Salem trials are etched into the consciousness of modern America, the human toll a reminder of the dangers of intolerance and persecution. The refrain 'Remember Salem!' was invoked frequently over the ensuing centuries. As time passed, the trials became a milepost measuring the distance America had progressed from its colonial past, its victims now the righteous and their persecutors the shamed. Yet the story of witchcraft did not end as the American Enlightenment dawned - a new, long, and chilling chapter was about to begin." America Bewitched shows how witchcraft continued to be a matter of life and death for many all over the vast country, even though the law no longer sent witches to the gallows. In fact, more people were killed as witches between 1692 and the 1950s in America than were executed before it. People from a variety of cultural backgrounds, including German, Dutch, Italian, Irish, Spanish, African and Native American, had their own beliefs about witches. If a cow sickened or an infant died, the old woman who lived on the outskirts of the town might still be blamed for causing the malady through magic. Sometimes an individual would take the law into their own hands, along with a gun, and murder the feared neighbour. Sometimes they might gather a lynch mob to do the deed. Yet the history of American witchcraft in the 18th, 19th and 20th centuries also shows how different cultures interacted and shaped each other's languages and beliefs. There was a mingling of folklore, customs and traditions, as well as a desire to build the American dream and make the country a place where everyone could prosper harmoniously. The OUP website says: "This is therefore much more than the tale of one persecuted community: it opens a fascinating window on the fears, prejudices, hopes, and dreams of the American people as their country rose from colony to superpower." I enjoyed - and learnt a lot from - the entire book. However, the last chapter is perhaps the most interesting to me personally, as it is about witchcraft in the USA in modern times. It explains that Wicca, the pagan religion largely created by Gerald Gardner in England in the mid-20th century, travelled across the Atlantic in the 1960s with Raymond and Rosemary Buckland as well as Donna Cole. Another English woman who promoted a British style of witchcraft in America was Sybil Leek, who came from Burley, in the New Forest. American feminists, most famously Starhawk, looked back to Salem and the "Witch Craze" worldwide to see the persecution of witches as being the persecution of women; and another powerful trend in goddess-orientated witchcraft was born. The occult has also been popular TV and movie material in modern-day America. In the 1960s, there were programmes like The Addams Family and Bewitched, while more recently Buffy, Sabrina the Teenage Witch and Charmed have attracted big viewing figures. Witches were no longer seen as evil old hags who only caused mischief through magic; they were now just as likely to be pretty young women who cast spells to help their friends and family. Owen Davies points out that although 20th century neopagan witchcraft movements have little historical continuity with earlier beliefs, Witchcraft is still as much "a matter of the present as the past". He ends by calling for monuments to be built for those who were persecuted, abused and murdered as witches in America after 1692.